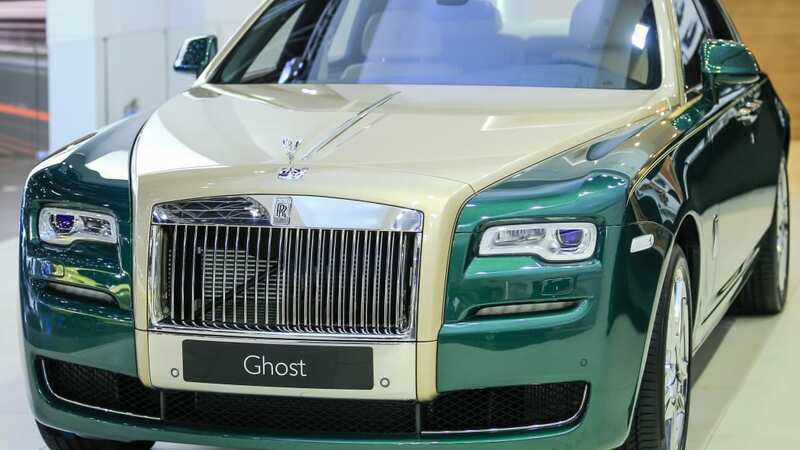 True to style, Rolls-Royce arrived at the Dubai Motor Show this year with some new special-edition wheels. Leading the charge was the Golf Edition of the Ghost. Ordered up specially by the local importer, the Golf edition "takes its inspiration from the fairways to appeal to discerning sportsmen, incorporating design cues and materials that evoke the history of this gentleman's sport." 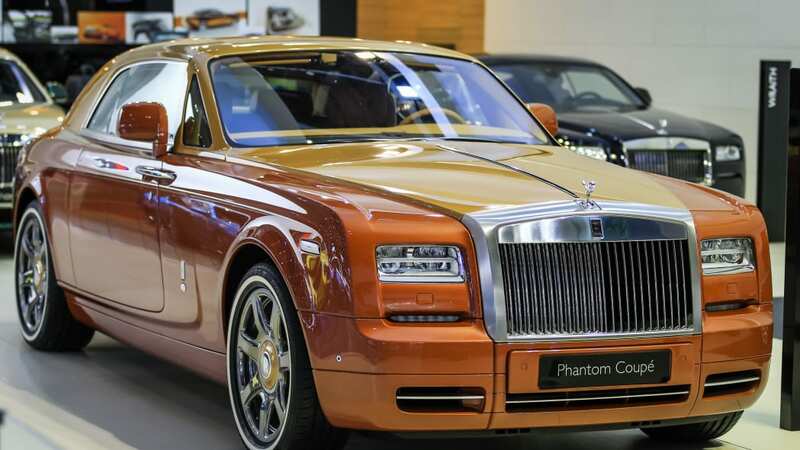 What that translates to in practical terms (as if a Rolls-Royce could ever be considered "practical") is a two-tone paint job of dark green and beige and a three-tone interior treatment of light cream, dark green, and deep red. The cabin is also augmented by the requisite starlight headliner, custom picnic tables, and lambswool floor mats. Tartan-lined door pockets, mahogany and persimmon wood veneers, and other special touches round out the unique treatment aimed at golf enthusiasts. 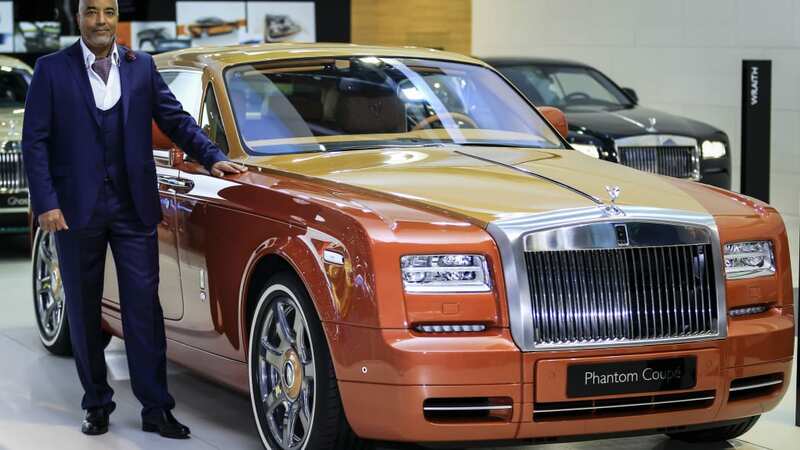 The special Ghost was joined as well by the one-of-a-kind Tiger edition of the Phantom Coupe. This unique take on Goodwood's big two-door boasts a rather unsubtle paint scheme of dark and light orange, complimented by a tiger-motif coachline. Fortunately things are relatively more toned-down inside, with tan and beige leather and a proliferation of custom accents to conjure the large striped feline. The pair follow hot on the heels of the 1001 Nights edition of the Ghost that was introduced in the UAE mere weeks ago. 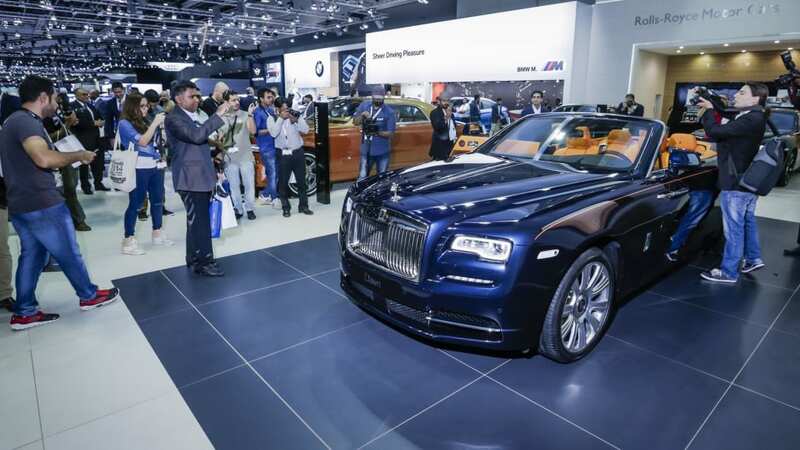 Rolls also took the occasion to showcase the new Dawn convertible and the Wraith Inspired by Music edition at the Dubai show. Both are based on the same architecture, the former with a fabric top and the latter – revealed this past summer – with a fixed roof and trim drawn from the recording industry. Scope out the lineup in the image gallery above and the press release below. Rolls-Royce Motor Cars reaffirmed its mantle as the undisputed pinnacle of Bespoke automotive luxury with the unveiling of Phantom Coupé Tiger, Ghost Golf and Wraith 'Inspired by Music' at the Dubai International Motor Show, on a day that also saw the Rolls-Royce Dawn make its first public appearance in the region. A selection of motor cars with inspirations ranging from the ferocity of the jungles of India to the serenity of North America's woodland greens; from the anticipatory romance and energetic excitement of a breaking dawn to the myth and legend of the contemporary music scene during the birth of Rock 'n' Roll, fittingly made their entrance in evocatively-named colours such as: Brooklands Green, Desert Dune, Burnt Orange, Lyrical Copper and Midnight Sapphire. This quartet of motoring masterpieces, featuring two one-of-one highly Bespoke commissions, a limited-time only 'Inspired By' edition and a brand new model that has been described as 'the sexiest Rolls-Royce ever made', enthralled visitors not only with their ethereal splendour but with their innovative engineering that includes the 'Silent Ballet' of the quietest drophead roof retraction ever and the most exhaustively designed sound system in automotive history, Rolls-Royce Bespoke Audio. One of the most anticipated moments at the Dubai International Motor Show was the first public reveal in the Middle East region of the new Rolls-Royce Dawn. Dawn promises a striking, seductive encounter like no other Rolls-Royce to date, and begins a new age of open-top, super luxury motoring. This beautiful new motor car offers the most uncompromised open-top motoring experience in the world, and is the most social of super-luxury drophead motor cars. Compromise is not a word recognised in the Rolls-Royce lexicon. Indeed the company continues to live by the ethos of one of the company's founding forefathers Sir Henry Royce to "Strive for perfection in everything you do. Take the best that exists and make it better. When it does not exist, design it. Accept nothing nearly right or good enough." The final part of that maxim – "Accept nothing nearly right or good enough" has guided the Rolls-Royce design and engineering teams as they have worked to initiate a new age for open-top, super-luxury motoring. In a sector exclusively populated by the biggest of automotive compromises – the 2+2 seat configuration – Rolls-Royce accepted no compromise. And so, the new Rolls-Royce Dawn, the world's only true modern four-seater super-luxury drophead, was born.The new Rolls-Royce Dawn stands apart from its stable mates, featuring 80% unique body panels. 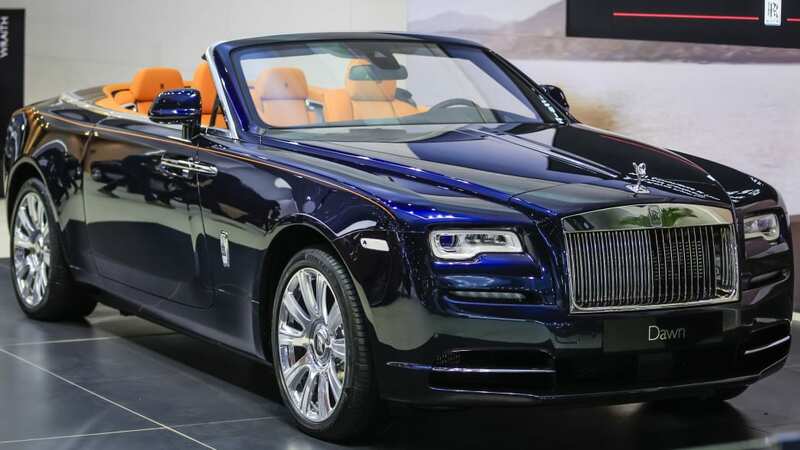 Indeed such attention has been paid to ensuring this amazing new dawn for super-luxury motoring delivers on its promise, even the tyres that connect the new Rolls-Royce Dawn to the road are new. The Rolls-Royce Phantom Coupé Tiger draws its design inspiration both visually and spiritually from its animal namesake, conveying its power, grace and ferociousness in an iconic automotive form. This one-of-a-kind edition features an eye-catching two-tone Burnt Orange and Arizona Sun exterior, reminiscent of the auburn-toned fur of this magnificent creature, highlighted with a Tiger motif twin coachline. Sleek and poised with a commanding, powerful presence, the Tiger Phantom Coupé features a striking interior of Tan and Seashell leather with hand-stitched embroidered Tiger motif headrests, Moccasin Lambswool floor mats, Maccasser Ebony Veneers and Bespoke Tiger Phantom Coupé treadplates, reinforcing its 'one-of-one' exclusivity. Conceptualised by AGMC, the sole dealers of Rolls-Royce Motor Cars in Dubai, Sharjah and the Northern Emirates of the UAE, and taking more than two years to be realised by a team craftspeople at the Home of Rolls-Royce in Goodwood, England, the Bespoke Ghost Golf edition takes its inspiration from the fairways to appeal to discerning sportsmen, incorporating design cues and materials that evoke the history of this gentleman's sport. A breath-taking two-tone exterior featuring a contrast Bespoke paint combination of Brooklands Green and Desert Dune resonates strongly in Dubai, where luscious green golf courses of the highest international calibre are set against the majestic background of the surrounding Arabian desert sands. Showcasing the breadth of Rolls-Royce's Bespoke offerings, the interior of the car features tri-colour leather in Crème Light, Pine Green and Hotspur Red accented by contrast stitching and seat piping, in addition to Lambswool floor mats, a starlight headliner and Bespoke picnic tables. A host of subtle golf-inspired features can be found throughout this unique motor car, including door pockets lined with tartan and cross-banded Mahogany veneers using Persimmon wood, a popular material used in the creation of wooden clubs historically. The Golf theme is completed with a pine green steering wheel and personalised tread plates. Making its regional debut at the show, the Rolls-Royce Wraith 'Inspired by Music' completes the trilogy of striking and distinctive Wraith 'Inspired by' Bespoke collections launched by the brand in 2015. Wraith 'Inspired by Music' celebrates the brand's long-standing love affair with the music scene, with some of the world's most celebrated artists choosing the marque as the ultimate affirmation of their success. Its effortlessly cool appearance complements the superior Bespoke Audio system; the contemporary use of copper creates an atmospheric setting for the most encompassing music system on the market. A Lyrical Copper exterior paint finish, presented with a blend of brushed and polished textures elegantly hints at the use of copper in only the very best audio systems. On opening the car's coach-doors attention is drawn to re-imagined speaker grilles, here presented in copper theme, and engraved with the words 'Bespoke Audio'. The door panniers and floor mats have been crafted from finely-woven leather to add an additional depth of tactility to the car's interior cabin. Copper-coloured door inserts, which start at the front of the cabin before tapering at the rear, have been included in the design to emphasise Wraith's characteristic internal curves. A book-matched copper finish features for the first time on Wraith's fascia, boldly extending the car's theme. The same copper tone extends to Wraith's signature seat bullets. The fastidious detail that went into the development of the car's sound-system is employed in every facet of the construction of the car. For example, the chaplets on the clock have been designed and meticulously crafted with a combination of warming copper and silver, whilst the radial lines of the outer bezel playfully emulate the look and feel of vinyl records. 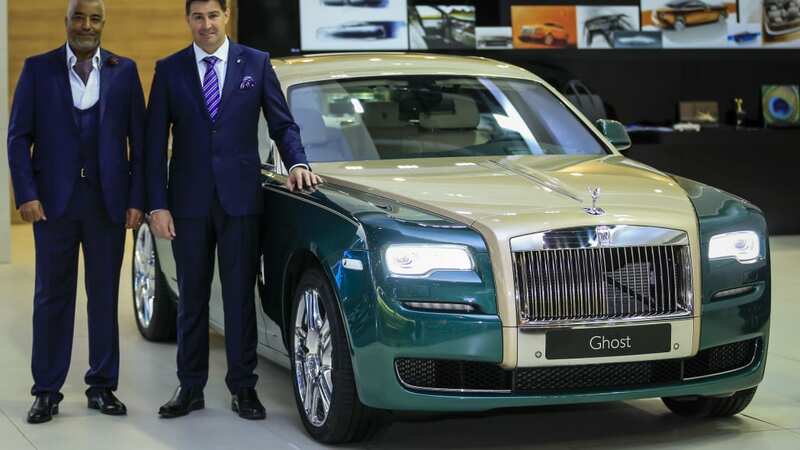 Commenting on Rolls-Royce's participation at the show, Brett Soso, Regional Director of Rolls-Royce Motor Cars, Middle East, Africa, Central Asia & South America said: "It is with great pleasure that we display four of our models at this year's Dubai International Motor Show. From Dawn, the perfect blend of timeless yet contemporary luxury, to Wraith 'Inspired by Music', that appeals to a more urban customer, to the Rolls-Royce Phantom Coupé Tiger and Ghost Golf editions that both showcase the scale of personalisation available through our Bespoke programme, our presence at this year's show demonstrates the sheer diversity of our portfolio perfectly." 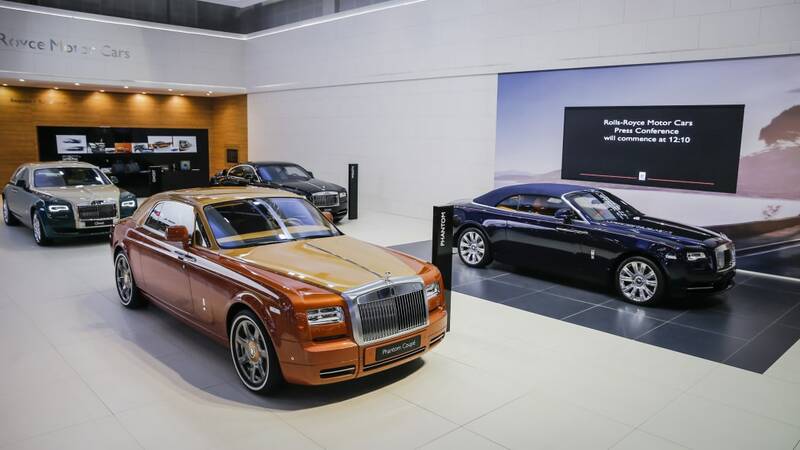 Motoring enthusiasts will have the opportunity to view these exceptional models at Rolls-Royce Motor Cars' stand at the Dubai International Motor Show at Dubai World Trade Centre until Saturday 14 November.